Bit-torrents have proliferated in the recent years. They are the black sheep of the Internet. Something that the film and music industry would love to get rid of. Everybody's heard of The Pirate Bay or Demonoid. The reason that this model survives even today is because there is no big software warehouse that stores all of that juicy media. Files are located on multiple personal computers and are shared from user to user in any place of the world and without an account. That doesn't mean you can safely download whatever is on HBO, however. Or if you do, make sure you can delete your tracks. For example you can keep a couple of electromagnets nearby in case the police comes busting down the door to confiscate your rig. 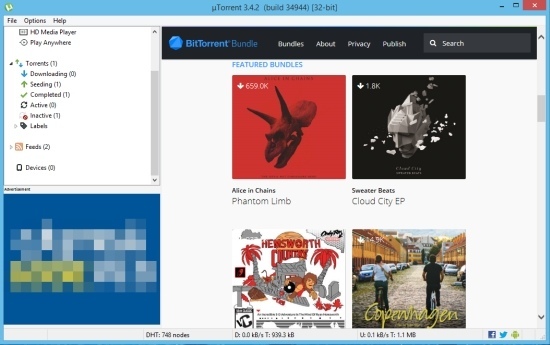 BitTorrent Bundles highlights different artists and allows the download of media bundles. Album samples, movie stills, trailers and other materials are showcased and can be downloaded by a simple click of a button. uTorrent can also gather RSS feeds. It can list the headlines where from you can open them in your default browser. The Bundles may be of interest but the RSS feeds are probably better suited of being followed by the web browser itself. uTorrent is probably the best choice if you're looking to maintain traffic on your torrent files, as it does not encumber other computer activities. Go for it!